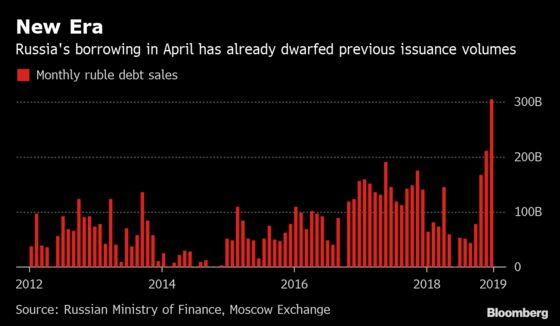 (Bloomberg) -- In the new era of jumbo Russian debt sales, barely a week goes by without a fresh record going up in smoke. Wednesday’s first of three bond sales totaled 85.1 billion rubles ($1.3 billion), more money than was raised in the whole month of January. Today’s borrowing means the Finance Ministry has already raised more than four times its monthly average in April. Demand for the auction totaled 132 billion rubles, the most ever for a single offering from the country. Juicy real yields, fatigue in Washington over pursuing new sanctions, and a global hunt for higher returns as central banks step away from tighter policy are all making Russia’s local bonds hard for investors to resist. The ministry is also free to meet the uptick in appetite after tweaking its rules at the start of the year to remove a limit on the amount of debt it can sell at its weekly tenders. “Ruble bonds have become a goldmine for yield hunters as news about sanctions vanishes,” said Vladimir Miklashevsky, a strategist at Danske Bank A/S in Helsinki. Just over a year ago, Russia’s markets were tumbling after shock U.S. sanctions paralyzed one of the nation’s biggest companies. As the rout resumed in the summer, the ministry was forced to ax a string of auctions. The ruble’s carry trade return is the biggest globally so far this year and Russia’s local bonds have earned investors almost 13 percent, the most in emerging markets. With oil near $72 a barrel, Russia has no particular need for the extra fundraising. But First Deputy Central Governor Ksenia Yudaeva warned in an interview this week that the picture could change fast and Russia shouldn’t get too comfortable with the inflows. Global monetary policy could “just as quickly turn in the opposite direction,” she said. The note of caution comes as Russia’s regulator weighs a possible return to monetary easing later this year. In a note released a few hours before the auction, Deutsche Bank AG strategist Christian Wietoska recommended buying the ruble over the Mexican peso, despite the continued threat of new sanctions.